Research and write persuasive briefs, submissions, and written addresses. Filter your persuasive-writing prowess through the alembic of The Write House’s astounding and outstanding pedagogy. Then you can implement writing that captures judicial imagination. When you write as we teach, the judiciary will fall in love with your majestic prose, while looking askance at your opponent’s lumpen apologetics. 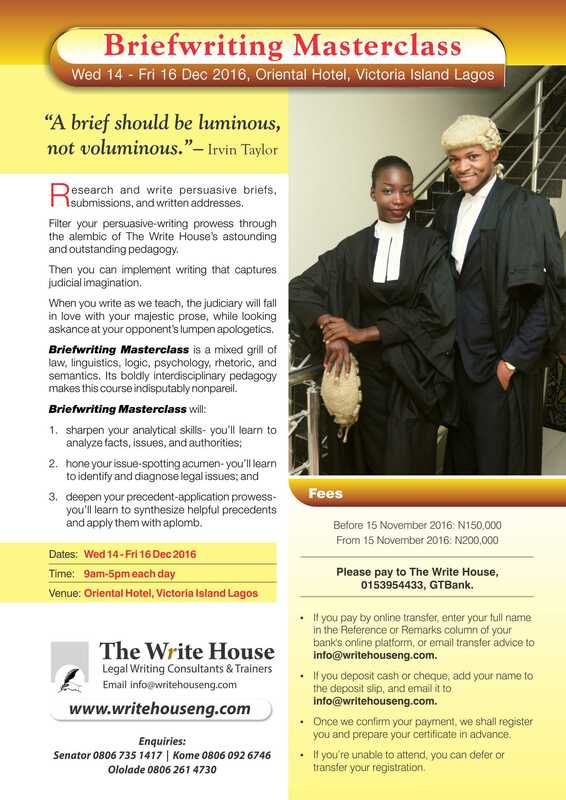 Briefwriting Masterclass is a mixed grill of law, linguistics, logic, psychology, rhetoric, and semantics. Its boldly interdisciplinary pedagogy makes this course indisputably nonpareil. 3. deepen your precedent-application prowess- you’ll learn to synthesize helpful precedents and apply them with aplomb. If you pay by online transfer, enter your full name in the Reference or Remarks column of your bank’s online platform, or email transfer advice to info@writehouseng.com. If you deposit cash or cheque, add your name to the deposit slip, and email it to info@writehouseng.com. If you’re unable to attend, you can defer or transfer your registration.